September is the very first National Chicken Month in Canada. It is a time for us to celebrate farmers for all their hard work as well as their dedication to farming. As consumers, we rely so heavily on our Chicken Farmers. Did you know that 90% of farms are family owned and operated? It is no wonder that chicken is Canada’s #1 protein source! The Chicken Farmers of Canada contribute $5.9 billion to Canada’s Gross Domestic Product and support other farmers by purchasing over 2.5 million tons of feed. They are active in their communities and regularly donate to local food banks. If this wasn’t enough, the chicken industry supplies 78,200 jobs so it is constantly stimulating the economy! With all that Chicken Farmers of Canada do for Canadians, there is no better way than to show our love and support by kicking it off the #IHeartChickenFarmers Twitter Party! 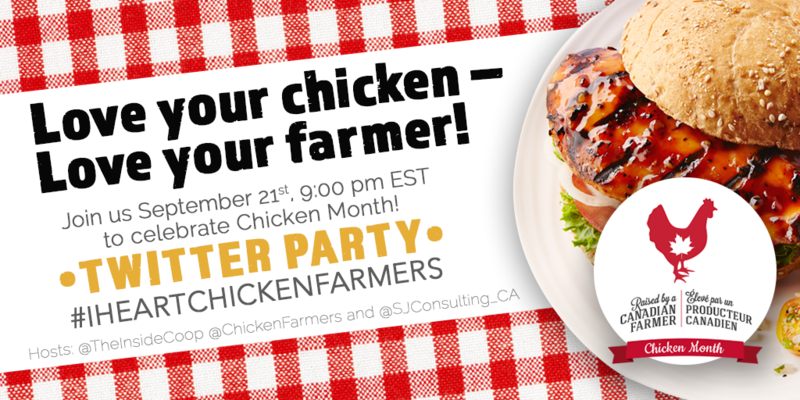 Join us while we talk about our love for Chicken Farmers of Canada as well as delicious chicken! There will be a coop full of chicken fantasticness: join us for a fun and informative chat, as well as some awesome prizes! Come Join Us on September 21st at 9 pm EST!